Hi Everyone! 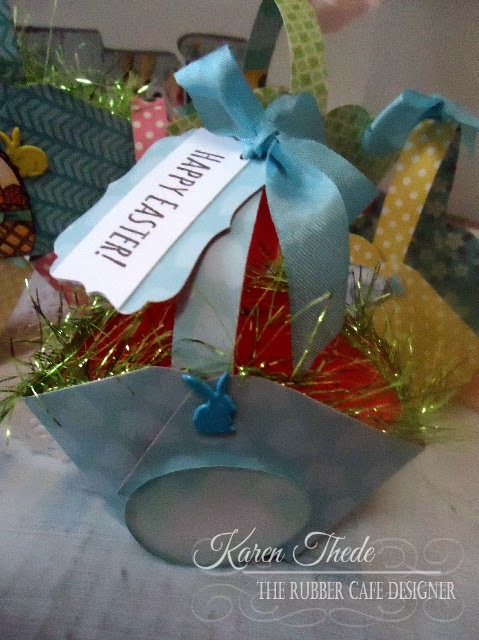 Today I'm going to share some "sweet" little treat baskets that you can share with family and friends, and would make a wonderful addition to your Easter table this season! 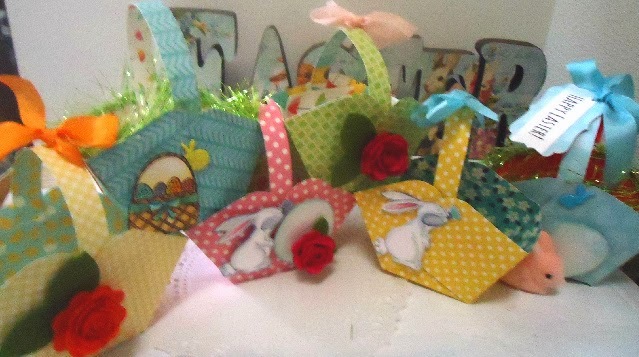 I'm using the patterned papers from the 6x6 pad included in your kit, which was perfect, as the basis for each of these baskets, begin with a square piece of paper measuring 6 x 6! 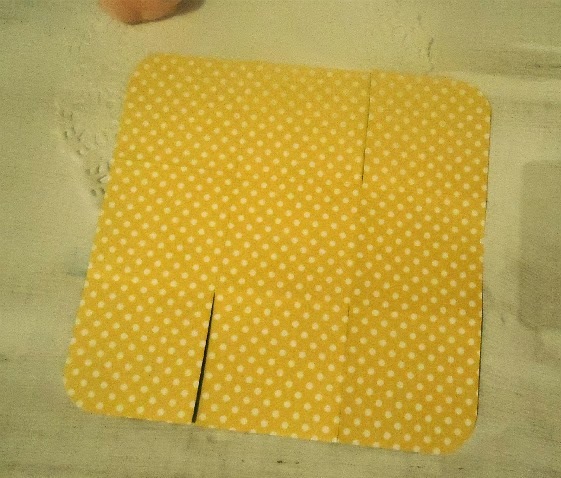 With this pad, when you pull out a sheet from the pad, you'll see each has a hole in the center at the top - the sheet measures 6 1/2 x 6 so by cutting off that 1/2" from the end with the 1/4" hole, these became the handle for my basket! It's a perfect place to weave in ribbon and tie off in a bow. As you can see in my picture below. 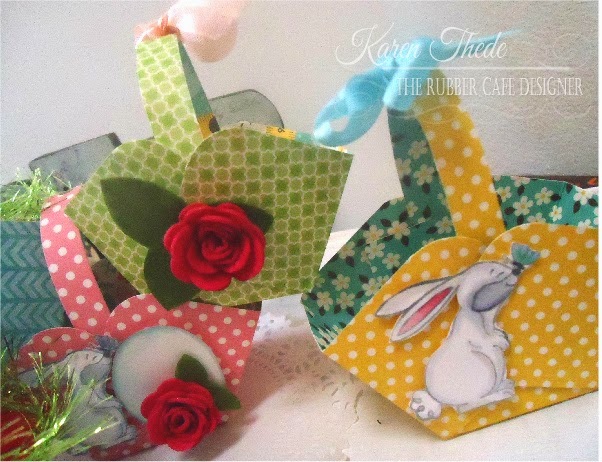 So let's get started on how you make these super simple baskets! Now that you have your 6 x 6 piece of paper, get out your Scor-Pal and score in at 2" on all four sides. Reinforce each score line - this will divide your piece into 9 equal quadrants. 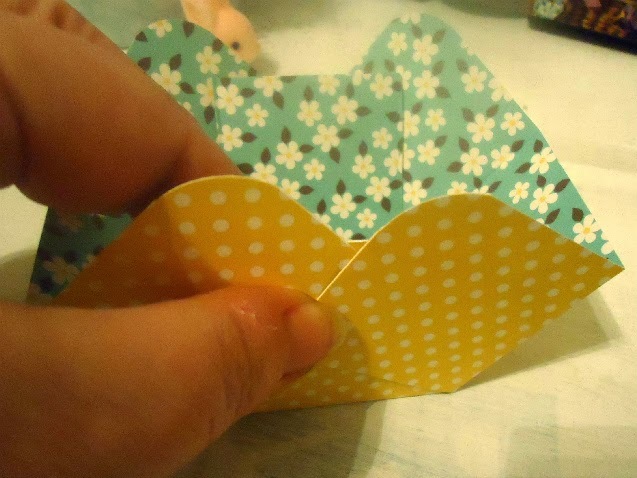 Next I took my corner rounder to each corner this is optional but I like the effect! Now you're ready to pull in your ends to create the basket shape - but before you do, attach your handle ends to the center straight piece, so it will be enclosed when you shape your basket. Repeat this on the opposite side. 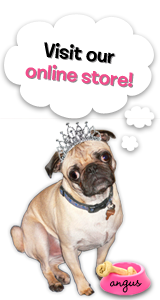 That's it- now you can decorate and fill as desired! To decorate some of mine I used the fun grassy green fringe trim by adhering to each side of my basket before shaping it. I used 1/8" Scor-Tape for this, it's strong and was the easiest way to apply this fine trim to the edge, as you see in the picture below. I also used the cute bunny brads to hold my ends together, which gave it a sweet finish. 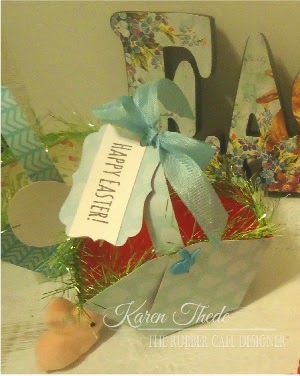 I tied on a tag with Happy Easter Greeting to the top of the handle with a ribbon bow. 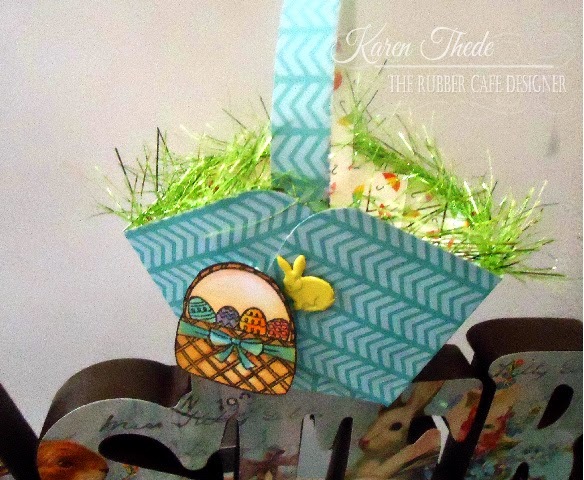 On this basket - along with my grassy trim, I colored and attached the Easter Basket and eggs to decorate the side. 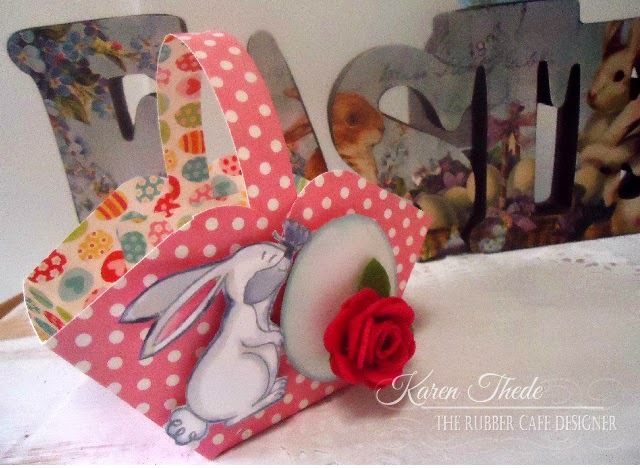 Here's a few more where I used a stamped bunny image from the Egg-stra Special stamp set included in the kit, and a couple have added a rolled felt rose I made also from your kit! Below is picture of the finished rolled rose, and how it looked before I started. To create all you do is start rolling from the outside and go until you get to the center. Using a glue gun or Fabri-tac, (fast drying is what you want here) place some glue on the center and stick the rest of the rolled flower down onto the blob of glue and back it with one of the tri-leaf shapes also included. There are 2 sizes and 2 colors, so you can really go to town making these pretty flowers! Here' another look at them all together! 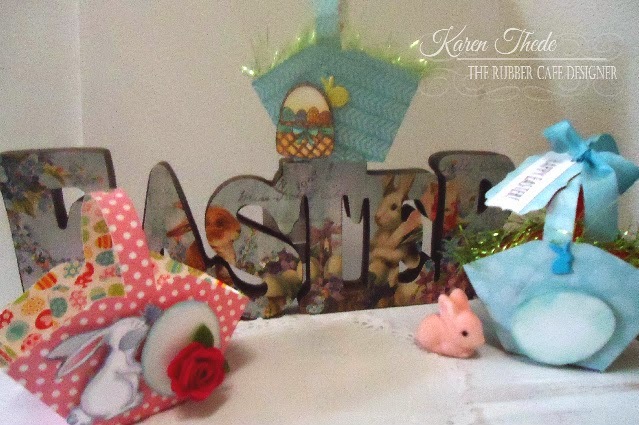 Embellishments: Blue; pink orange ribbon; and green fringe trim all from the kit; Bunny brads from the kit; Felt rolled roses -pink and orange also found in the kit.